When I first downloaded the new Windows Phone 7 Series developer tools CTP package, I found the new emulator to be very slow. This is the opposite of what I was expecting as the new emulator is built for x86, runs within a VM and supports hardware GPU host acceleration (so long as you have a gx capable of DirectX10 and at least support for DDI10) - which my laptop does. To determin whether you have DirectX10 support and at least DDI10, run DxDiag.exe from the command-prompt and inspect the Display tab. So after running this tool I got the above. 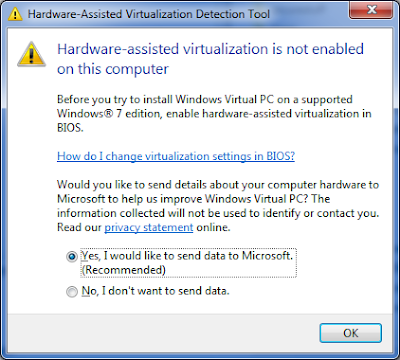 So this confirms that I didn't have hw virtualization enabled. After enabling it in the BIOS my Windows Phone 7 Series emulator is now running much faster!